I want to orient our exploration around this slogan because what’s interesting here, besides the witty double reference, is this notion of atmosphere that might be found during these kinds of events, events that are social and political expressions of a coming together in what Gary Genosko (2002) has referred to as a ‘flash of common praxis’, events like demonstrations, occupations and general assemblies predicated on antagonism, hope and invention. I want to look at the speaking of atmospheres, both in terms of the particular assemblages of spaces, infrastructures and sounds, and in terms of the voices that resonate to contribute to the feeling of a moment. Specifically here I make reference to the 2011 Occupy movement and its use of the human microphone, and the general assemblies that took place in Madrid in 2011. While the idea of voice is most usually associated with the capacity to participate in a representative democracy, I’m interested in how this participation is articulated in the sonic aspects of the voice, that is to say the accents, cadences, volumes, pitches, silences, that communicate as much as the words uttered do. Considering the soundings of the voice lets us do two things, firstly it helps us to amplify the non-human aspect, which is often drowned out by the human, by looking at the assemblages and ecologies that make up contentious spaces, and secondly it helps to be more sensitive to the differential voices we might hear, which invites us to explore who participates and how. The notion of an atmosphere or ambiance is difficult to define in any fixed way, for as Ben Anderson (2009) illustrates ‘as a term in everyday speech, atmosphere traverses distinctions between peoples, things, and spaces. It is possible to talk of: a morning atmosphere, the atmosphere of a room before a meeting, the atmosphere of a city, an atmosphere between two or more people, the atmosphere of a street, the atmosphere of an epoch, an atmosphere in a place of worship, and the atmosphere that surrounds a person, amongst much else. Perhaps there is nothing that doesn’t have an atmosphere or could be described as atmospheric. On the one hand, atmospheres are real phenomena. They ‘envelop’ and thus press on a society ‘from all sides’ with a certain force. On the other, they are not necessarily sensible phenomena.’ For Anderson, given this difficulty of definition we might consider atmospheres as ‘spatially discharged affective qualities that are autonomous from the bodies that they emerge from, enable and perish with’. For my purposes I want to focus on the connection of such spatially discharged affective qualities to sound and thus to the register of the sensorial (on a side note I will use these terms a little loosely for the purposes of this talk although they do not necessarily mean the same thing as a recent conference in London on ambiances and atmospheres in translation teased out). If an ambiance is a ‘space-time qualified from a sensory point of view’ as Jean-Paul Thibaud (2011) puts it, that is to say how a space is sensed, and how it feels, sound is a prevalent component. Sound surrounds us in all directions – we are immersed in sound on a pathic level. This is to do with the resonant frequency of sound, which means the vibratory quality of sound making it something that is felt through bodies on registers that go beyond that which is audible. In his work on sound and urbanity, Thibaud speaks of resonance as critical to sensing our environment – being entangled in our subjectivation. He writes ‘with the idea of resonance, the world of sound makes explicit the very power of ambiance. It helps to describe the very process by which I feel and sense the world’ (ibid). In this manner, sound was also crucial for Lefebvre’s conceptualisation of rhythmanalysis in mapping the rhythms and ambiances of place and space. A fundamental expression of sound, especially in spaces of contentious politics, is the voice – and by voice here I refer to the sonic aspects of the voice, how the voice sounds and moves through the air. In his work on voice and language Eduardo Abrantes (2012) argues that voices ‘define territories, in conversation, in public transportation, in the, sometimes awkward, transitions between private and public space’. Furthermore, and this is a point to which I will shortly return ‘they resonate identity, they are biographical sound happenings and can turn every listener into a bearer of this shared individuality’ (ibid). How we hear and feel sound, including of course the voice, is contingent on its relations to the material and virtual architectures of space. According to Brandon Labelle (2010) ‘sound sets into relief the properties of a given space, its materiality and characteristics, through reverberation and reflection, and, in turn, these characteristics affect the given sound and how it is heard. There is a complexity to this that overrides simple acoustics and filters into a psychology of the imagination’. LaBelle’s comment illustrates the intertwining of the spatial and the relational, at the same time as it indicates the role of the imaginary. The voice, its inflections and resonances, both fills space and is filled by the spaces into which it is projected, to set into motion worlds that encompass physical, psychic, emotional and affective geographies. The kinds of atmospheres of contentious praxis we are considering require a closer exploration of the interactions between architecture, sound and social practice. Here it is useful to address what Barry Blesser and Ruth Salter (2007) refer to as aural architectures: the ‘composite of numerous surfaces, objects and geometries’ of a given environment. Sounds require space and air for their form, which means they take shape on different scales of space just as they do different temporal scales. This is how spaces manifest sound, even if the sound energy does not originate from the space itself; this occurs through reverberation and reflection – spaces, through their material densities and gaps, modulate and refract sounds and voices in peculiar ways. This occurs too on the level of bodies, the bodily cavity being an anatomical acoustic chamber through which the sound of the voice is shaped. The physical spaces in which social and cultural politics become organized and collective in certain modes, the places of meetings, effect what kinds of voices are heard and how, just as the space-time of meetings change the nature of place. From community centres to squatted social centres, from university classrooms to public squares, roads to living rooms, from an outdoor camp or a union office to a Skype conference, the spaces in which political conversation and the performative praxes of political organization occur vary in dimension, architecture and temporality. It is imperative to recognize the reciprocitous dynamics of voices and the spaces in which they become, and make, present, because, in the words of Jean-Luc Nancy, ‘the sonorous present is the result of space-time: it spreads through space, or rather it opens a space that is its own, the very spreading out of its resonance, its expansion and its reverberation’ (2007). The same can be said for voices. The places in which organization occurs effects participation through differential inclusion, both in terms of a desire to be present and in terms of accessibility. Indeed a space or place may act as a ‘dispositif’ for the production of specific kinds of vocal utterances. This is why, as David Matless proposes, ‘sonic geographical understanding alerts us to the contested values, the precarious balances…which make up place’ (2005). The material and virtual geographies of these sites are steeped in narratives of power; the ways that people engage with, or participate within, spaces hinge on the associations they ascribe to them, the affects and psychic-emotional experiences they have, or project they may have, within them. Such experiences are informed by relations of class, of education, of socio-cultural affiliation, for instance, and may play out in desires for engagement or disengagement. How these atmospheres and spaces are experienced varies with the different emotions and percepts of the individual and the collective, but it is clear that architectures may have particular design elements conducive to producing specific states. Along with these codings of a particular site, architectural features, or lack thereof, impact upon the disposition and ambiance of an event through spatial acoustic qualities. As Blesser and Salter note, ‘auditory spatial awareness…influences our social behaviour. Some spaces emphasise aural privacy or aggravate loneliness; others reinforce social cohesion’ (2007). The size of a room or space and its volumic capacity, its resonant cavities, its density, its formal or informal feel and function, the arrangement of furniture or objects, all contribute to how the voice moves within it, the kinds of utterances that are likely to be made and the ways in which we listen and respond to one another. How we listen and respond is also necessarily underpinned by the actions, technologies, desires and intentionalities that coalesce a particular atmosphere. Sound is the result of action and movement, as Thibaud notes with regard to ambiance: ‘it is not only the social activity itself that can be heard but the manner and the conditions in which an action is accomplished. This is why ‘sound is a very useful medium that can help us document the social expression of an ambiance’. The use of sound to explore the geographies and ambiances of contentious politics invites us to consider the methods and techniques of voicing. 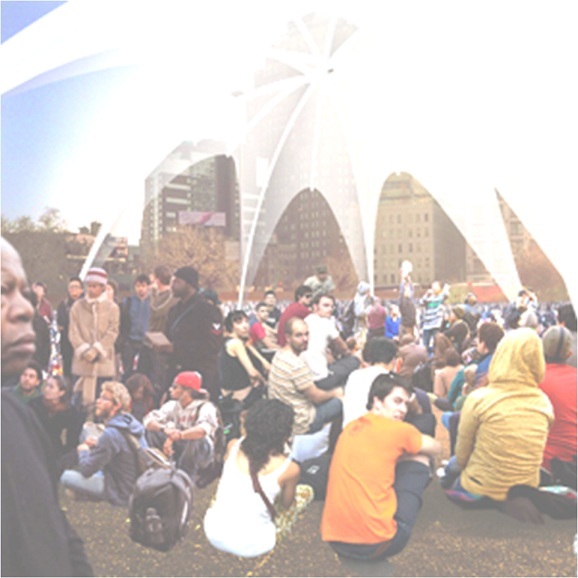 The human microphone, used during Occupy to extend and amplify voices of speakers when electronic amplification was banned by police, provides one point of illustration. The voice in this sense travels where the body cannot, the voice through these processes of amplification, these communicational and sonic waves extend the reach of expression, resonating within the spaces of Zucotti Park and Wall Street, environments of course marked by long histories of capital accumulation and elitism. The technology of the human microphone, combined with an ethos of openness and commons, put into resonance voices that are atypical for those spaces, unfolding through the voice and through the vocal praxis, as much as through what is said, a counter-power that challenges the hegemonic inhabitation of the space. Significant too are the voices that permeate and co-create such ambiances, the voices that are heard and those that remain silent, that trace out forces of differential inclusion based on intersectional reproductions of racial, gendered, classed, and abled expressions and mannerisms. For one participant of occupy, the human microphone articulated the assemblages of desire and ideology supportive of open communication. We might though also be mindful of how the communicative chains of such technologies can be invisibly iterative of vocal-acoustic territorialities that inscribe delineations of congruity or incongruity (which is especially apparent in comments made by participants about the conflictive voices, the voices that yell out mic check to no response, the disruptions). As Abrantes has argued with respect to such territories and vocal individuation, much can be read in the way the voice interacts with the other ‘voices present, according to its rhythm, its articulation of speed, the spaces it creates for the participation of others, and the spaces that it chooses to fill when inscribing its own participation’ (2012). When the acoustics of voice make tangible the meaning of the situation, interruptions and interferences trouble the perceived synchronicity of the voice and what it is expressing in relation to all other voices (and again, I am referring to the sonic, not linguistic aspects of voice). The implications of the voice in the ambiances of contentious politics cannot be overstated, and this is something I have spoken extensively about in my research on voice and organization: how the sonic qualities of the voice affect our capacities to listen and respond to one another. The convergences of vocal tones, accents, cadences, with emotions, desires, affects, techniques and practices of organization, ideologies, architectures, technologies, infrastructures and mechanisms of state repression (including the use of specific sonic warfare), social, cultural, economic landscapes assemble sound environments that are complex and highly mutable. An interesting conjunction to mention here is the role that listening played during the general assemblies in Madrid in 2011, which arose during the occupation of the Puerta del Sol following the arrest of 24 demonstrators during a national day of action against the banking bailouts and the cutback of social programs. In a climate of austerity and the fragmentation of work and welfare, the ways of listening during general assemblies revealed the creation of other ways of being and relating, antagonistic of, and alternative to, those being experienced. In these atmospheres and environments of contentious politics the multiplicity of voices mix together in an affective tonality that specifies an ambiance. Addressing these ambiances we can ask how they might feel, how they are populated and what they transduce. To think through affective atmospheres is also to think through processes of subjectivation, which lie at the heart of contentious politics, as Anderson affirms ‘affective atmospheres are a class of experience that occur before and alongside the formation of subjectivity, across human and non-human materialities, and in-between subject/object distinctions. As such, atmospheres are the shared ground from which subjective states and their attendant feelings and emotions emerge’ (2009). They create ‘a space of intensity that overflows a represented world organized into subjects and objects or subjects and other subjects’ (ibid). As such atmospheres generate interference in the representationalism and the easy classification that is being contested in the experimental and novel articulations of contentious politics I am interested in. This is further ameliorated by the changeable nature of their constituencies and their compositions. These are not static environments but mobile and temperamental ones, as defined as much by what is heard and felt as what is not. By ‘emphasizing the temporal, active and collective dimensions of sound’ as Thibaud stresses we are able ‘to study and to document the unfolding of an atmosphere’ (2011). Attention to the soundings of atmosphere, and I would argue, the voicings of atmosphere, can contribute to a practice of observing that is nuanced and sensitive in its reading. This is a useful perspective to take if, as I raised in the introduction we wish to engage the non-human elements that contribute to these atmospheres, and also if we hope to be more attuned to the differential voices we might hear. And this, I would propose, is particularly relevant in the atmospheres of contentious politics, where as was indicated by the final voice we heard, what is being invented are other ways of making worlds. 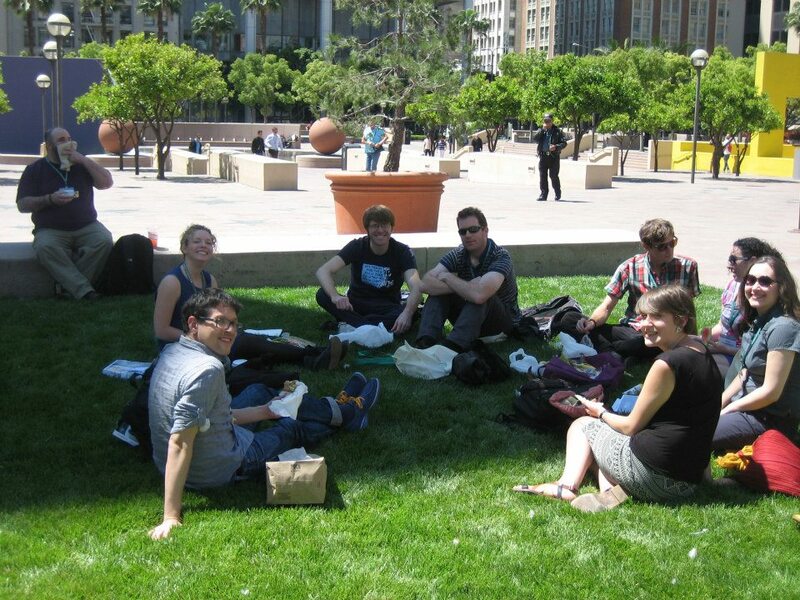 Several members of the protest camps research collective converged in L.A. this April for the Annual Conference of the Association of American Geographers (AAG). It was an opportunity not only to present and discuss our research in the conference itself, but to catch up with and meet others involved in radical geographical projects. It also gave us a chance to spend time with local activists, and generally explore the dizzying metropolis that was hosting us. Many of us spent the first day with the Subconference, a loose collective that has popped up on the fringe of the AAG for the last 3 years, seeking to facilitate a space for exchanges, solidarity, and creative action. This year we produced a small zine, highlighting some of the best of, and worse of, the conference. It also contained a critical survey of the AAG with hopes of bringing other people’s ideas for improving the (sub)conference forward in future years. Day 2 hosted a 6 hours session on action research and activist scholarship in which protest camp members joined an impressive selection of radical geographers talking about their research projects over the last four decades. Day 3 saw a double session on “Uprising Geographies”, hosted by protest camps’ Adam Ramadam and Sara Fregonese, and with talks by Anna Feigenbaum and Fabian Frenzel on their fascinating “campfire chats project”, and Sam Halvorsen on Occupy London. Meanwhile, there were talks by protest camps members Anja Kanngieser on the radical political economies of communication, and Christian Scholl on controlling transnational dissent. These talks represent just a fraction of the sessions that consisted of geographers working on radical themes: from anarchism to feminism, queer geographies to race and black Marxism, as well as an array of sessions on social justice, hope and new social movements. The presence of the protest camps collective at the AAG is part of a renewed optimism that geographers are opening up spaces for thinking about creating other worlds. The popularity of the subconference suggests that there is also an increased determination to practice what we are discussing – “walking the talk” as the action research sessions described it. As we walk the talk together, disciplinary boundaries are increasingly broken down and the protest camps collective is a good example a transdisciplanry network of radical researchers. The final day for most of the collective was spent with The Public School, an autonomous teaching collective based in LA’s china town. They hosted a session called “Radical Geographers and Anticapitalist Politics: Dispatches on research and action” in which we were able to trace out diverse continuities between the work of protest camps researchers and fascinating projects including Mara Ferreri’s countermapping, Lisa Hirmer’s experimental artwork, and Etienne Turpin’s architectural collaborations in South-East Asia. As the protest camp network keeps expanding and experimenting with ways of working together, we encourage others to join in. Forming inter-disciplinary, transnational alliances with those who share similar interests and aims helps us build new spaces for radical academic research. The ZAD protests have received little in the way of mainstream media coverage, particularly outside of France, despite being the biggest Euro-Zone action camp in history. Citizen, independent and social movement journalists and documentary filmmakers are filling up this unsurprising gap in media coverage with footage of their own. ProtestCamps.org offers this brief round-up of some of youtube’s best videos on ZAD for English-speakers. The 52 minute documentary Notre Dame des Luttes by Jean-François Castell has now been translated into English. The film captures the early months of the mass action camp. It does a nice job giving voice to protesters’ stories and reasons for joining ZAD. Taking us into the forest, Castell captures the entanglements of living in the woods — the cold, the ropes, the tents, the fires are all characters in this film. Police violence and the state of ‘living in a war zone,’ as one participant describes it, are also present here. The camp becomes a site of violence and vulnerability, as well as a vibrant space of solidarity and skill-building. PIXSO’s edited footage for this short 8 minute documentary video does a nice job of showing the scale of these protests and the creativity of tactics being used to ‘defend the zone.’ While most of the video is in French, the visual narrative carries the film and is able to capture the spirit of ZAD. Footage at 6 minutes shows discharged canisters of tear gas being dumped out by the bagful, illustrating the extent to which this poisonous chemical weapon has been used against protesters. While it seems to have less youtube play than others, Zone A Défendre would be a great film to subtitle and further circulate. Additional footage of evictions, actions and campaign speeches can also be found in videos from webTV productions Rennes TV. Most of these films are roughly edited but lengthy, offering coverage of some major mobilisations as well as footage of more intimate moments. Protest Camp Research Network member Adam Ramadan along with colleague Sara Fregonese are running a double session at the Association of American Geographers Conference on ‘Uprising Geographies’ in Los Angeles on April 11, 2013 in the San Bernardino room of the Westin Hotel. The line-up also features Research Network members Anna Feigenbaum, Fabian Frenzel and Sam Halvorsen. If Terror was central to popular and official understandings of security in the past decade, might Uprising be key to urban, national, and global geographies of security in the current one? Since the end of 2010, the uprisings of the ‘Arab Spring’, the anti-austerity protests across Europe, occupations and encampments in global cities, and the Summer 2011 riots in London, suggest a new political moment of mass disaffection and disobedience. Beyond the specificities of individual events, uprisings worldwide have demonstrated the presence of shared concerns about social justice, human rights, and democracy for transnational geographies of solidarity and organised resistance. In response, discourses and practices of state and urban security are shifting from the spectre of major terrorist attacks to managing popular disobedience and policing its spaces. As uprisings create new tactics and practices of territoriality, states reassert their sovereignty through new arrangements of policing and securitisation. From Cairo and Homs to Athens, Madrid, and New York, we have seen strong and often violent collisions between resistance movements and state security. Cities constitute physical and symbolic terrains for socio-political change. If 2011 has seen the inception and revival of geographies of mass protest and resistance in cities all around the Mediterranean, 2012 sees the continuity and spreading of these practices (and responses) to urban spaces worldwide. How are these collisions reshaping the political geographies of communities experiencing uprising? 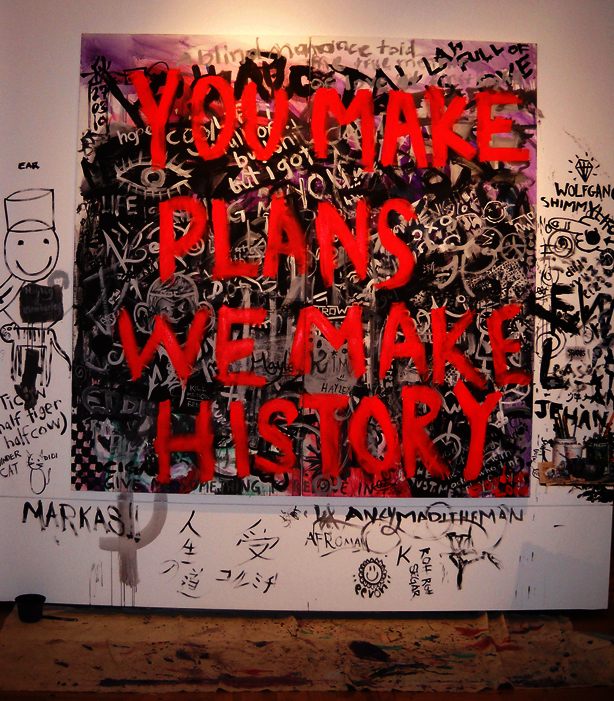 What are the likely scenarios, the spaces, practices, and performances emerging from the uprisings? 3:20 PM Author(s): *Elisa Pascucci – University of Sussex – Abstract Title: Aid, Security and Neoliberal Urbanism in Cairo: spatial practices of containment after the Mustapha Mahmoud protest, 2005. Last week Protest Camps hosted a roundtable looking at issues of innovation and creativity in place-based social movement activism. We asked doctoral student and teacher Sean T. Leavey from the Journalism and Media Studies Department, at Rutgers University to offer an overview of the event. 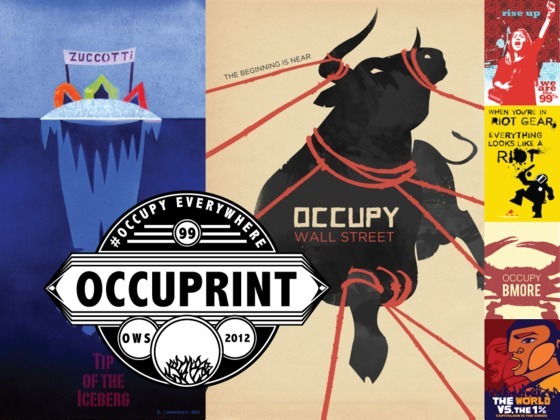 Since the emergence of the Occupy movement, the ongoing dialogue on the tactic of occupying places and spaces has taken many forms. 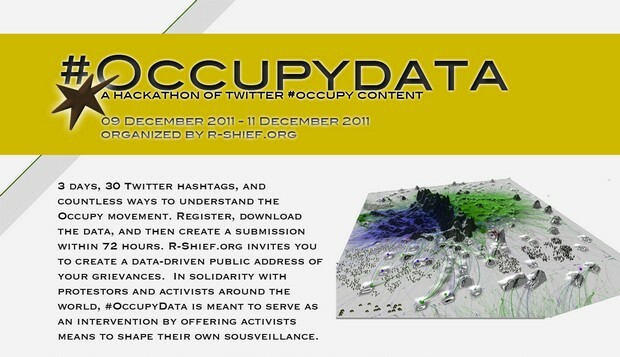 On February 21 2013 the theme of occupation was re-explored at the Occupy Innovation roundtable event at Rutgers University. Organized and moderated by Dr. Anna Feigenbaum, this event brought together a panel of activists, each innovative in their own work, around the topic of open source tactics and technologies in terms of place-based and space-based protest. Dr. Feigenbaum arranged the roundtable in light of current economic and security conditions, under which the options for creative, waged work are highly limited. Public protest, particularly the use of direct action tactics, is being statutorily curtailed, and even criminalized. The roundtable provided a forum for panel members, and those in the audience to discuss how to thoughtfully and creatively develop strategies for continual resistant practice against, and under, the ever expanding and simultaneously constraining net of neoliberal capitalism. Among the panelists there was a wide range of insight and expertise, as the roundtable was composed of architect Greta Hansen of 123 Occupy; artist Josh MacPhee of Occuprint, Just Seeds, and the Interference Archive; scholar and activist Dr. Patrick McCurdy of the University of Ottawa; Dr. Alessandra Renzi of the Sandbox Project and the University of Wisconsin; and Rutger’s own Dr. Todd Wolfson, co-founder of the Media Mobilizing Project (MMP), and professor of media studies in the University’s School of Communication and Information. Kicking off the conversation on innovation, architect Greta Hansen’s explained her work on the analysis of space in Zuccotti Park, and in turn, understanding the use of that space. 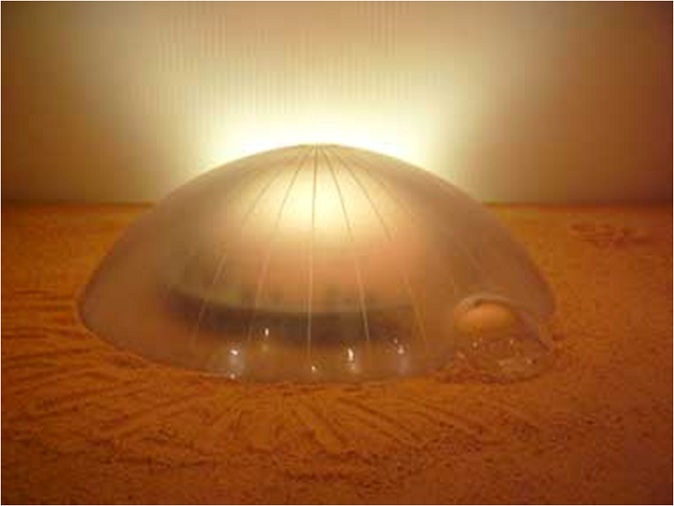 Hansen’s activism has included collaborating with a working group in mapping the park, and developing what could be termed technologies of occupation, specifically regarding shelters for living and medical emergencies, in the form of “anti-brand,” inexpensive, do-it-yourself tents and platforms, made of ubiquitously found materials, and inspired by the simple declaration of: be temporary. Following Greta Hansen, Dr. Patrick McCurdy extended on the necessity for innovation in meeting the challenges of occupying spaces and places in protest, showing where simple, ordinary technologies can be implemented alongside higher technology devices. 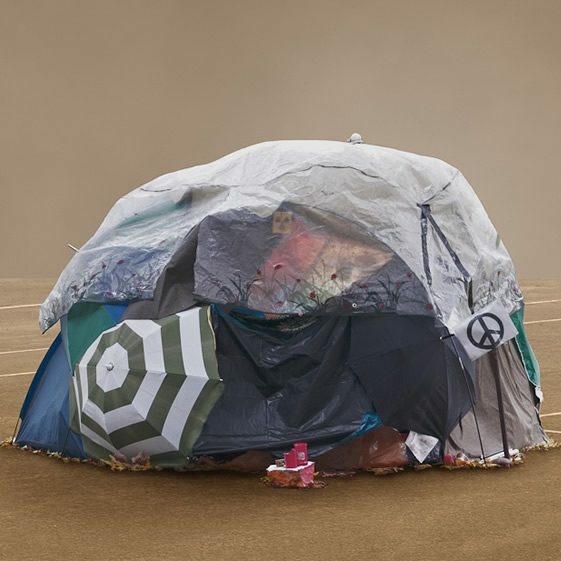 For instance, the Occupy Wall Street media outreach operation found a need to be creative in protecting electronic devices from the elements, after camp life was interrupted due to the prohibition of tents by city authorities. Activists utilized tarps and dumpsters to shelter computers and cameras, also making use of umbrellas, by physically holding them over the electronics, in order to shelter the equipment from falling rain. In terms of communicating, the people’s microphone helped avoid any snafus over restrictions on amplification in Occupy sites across the United States, and in Tahrir Square, protesters rewired lampposts for power, and used them to communicate across the occupied space, signaling to one another about police movements, by banging against the posts in a form of code. Next was Dr. Todd Wolfson, whose work with MMP follows in the tradition of Martin Luther King’s Poor People’s Campaign, and is inspired by the grassroots media activism of the Zapatistas. The efforts of MMP are aimed at organizing with poor and working people for improving labor conditions, and the quality of everyday life in Philadelphia. Early on, MMP coordinated with taxi drivers in the formation of Labor Justice Radio, and has campaigned with parents and members of local communities across Pennsylvania to save Head Start programs from peril. Like the previous speakers, Dr. Wolfson noted that though technological innovations are helpful, such things in themselves are not a value. It is in the use of innovations in creating connections across organizations and common struggles, which is where value lies. In terms of MMP, technological innovation is used to enhance traditional organizing strategies, which have proved invaluable to social movements. Without them, new platforms of communication would be limited in their utility. Dr. Alessandra Renzi’s comments followed on from Dr. Wolfson’s, aimed at expressing a reminder that notions of innovation and openness are also articulated through the logic of neoliberalism, posing the question: if innovation, openness, and flexibility are what the neoliberal order is demanding, what does it mean to occupy innovation? Dr. Renzi’s answer was a liberating and optimistic one, noting that those in struggle against the capture of daily life by neoliberal capitalism are already being innovative, embodying and employing open, creative practice and technology, in which talking about the occupation of innovation is redundant. Like Dr. Wolfson, Dr. Renzi’s ethnographic, scholarly, and activist work involves using media technologies to bring people together. Dr. Renzi collaborates with artists and other media activists in the development of programming involving participatory audiences, appropriating a part of the media dispositif, for the purpose of creating information and community. The last to deliver remarks, was artist and activist Josh MacPhee, pointing out that meaningful change comes out of people in motion, which is different than what we think or picture, as movements emulate each other, in the adoption, or under the influence of, fluidly circulating actions and practices. MacPhee demonstrated this in recalling a story about how activists from Tahrir Square had pizzas delivered those participating in the 2011 Wisconsin protests. Months later, those in solidarity with those in Zuccotti Park did the same, overlooking that the Occupy Wall Street site already had a robust kitchen and food distribution operation. The pizzas really were not needed, and the question became: what to do with the boxes? People made signs to share, which people could, and did, pick up and display, “sharing newsfeeds in an embodied way” by holding up signs others made. In this, MacPhee noted that, like the other panelists, forms of innovation are not necessarily found in higher technology affordances. Sometimes we have to look to what has been used in the past, rather than what is new to us. 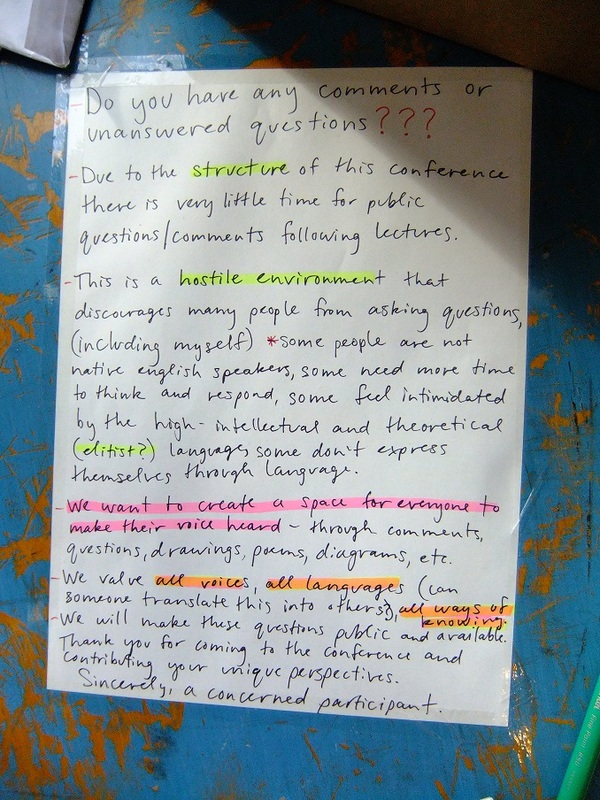 Following the initial remarks of participants, a conversation ensued in response to a question posed by Dr. Feigenbaum regarding the composition of the Occupy movement, specifically in terms of philosophical tensions over whether activists should personally engage in wage labor, and if it is ethical, or not, for activist work to be performed for monetary compensation. Immediately disabling the rationales for the former problem, Greta Hansen noted that along with their particular skill sets, wage workers from many fields, vocations, and professions can use the material resources at their disposal, scavenging and appropriating whatever is available for activist work. Also, that at Occupy convergence spaces, all types of expertise was seen as important, such as the skills of homeless people in winterizing temporary shelters. Dr. Wolfson concurred, stating that such matters are a contentious issue, and that the valorization of all kinds of labor is important. In this attempt to reimagine the world, Josh MacPhee declared that it is necessary to break the myth of frictionless capitalism, and it may be valuable to strive for being tactfully open, looking to create a surplus of relationships, to counter the capture of social surpluses by capitalism, as is done with Zipcar, corporate bike-share initiatives, and Kickstarter. Dr. Renzi noted though, that capitalism as a social system captures our desires, affects, practices, and sociability, which complicates understandings of cooptation, as we have to look to ourselves in how we are all implicated in willingly operating in the process of supportive production, since it is we who may use Zipcar and corporate-sponsored bike-sharing businesses, or give money to someone doing something creative through Kickstarter. Referencing his forthcoming co-authored book Protest Camps: Experiments in Alternative Worlds with Anna Feigenbaum and Fabian Frenzel, Dr. McCurdy turned a critical eye to media studies. He argued that one must creatively decenter media, and look to infrastructure, to counter the tendency in the field to treat ICTs and online platforms as isolated from broader technologies, structures and practices of protest media ecologies. Overall, the major take away from this event, as articulated by the panel, it is that innovation must not be based on the logic of profit, but instead built into protest as a form of antagonism able to work under and crack through the flexible power of neoliberal capitalism, to which there is no outside. Sean T. Leavey is a second-year PhD student and instructor, in the Journalism and Media Studies Department, at Rutgers University’s School of Communication and Information, in New Brunswick, New Jersey. Sean’s teaching and research interests include social movements and activism, popular culture, and media subjectivity. He is currently on a research team, working on a project investigating New Jersey’s digital divide, and is teaching a course titled Gender, Race, and Class in the Media. 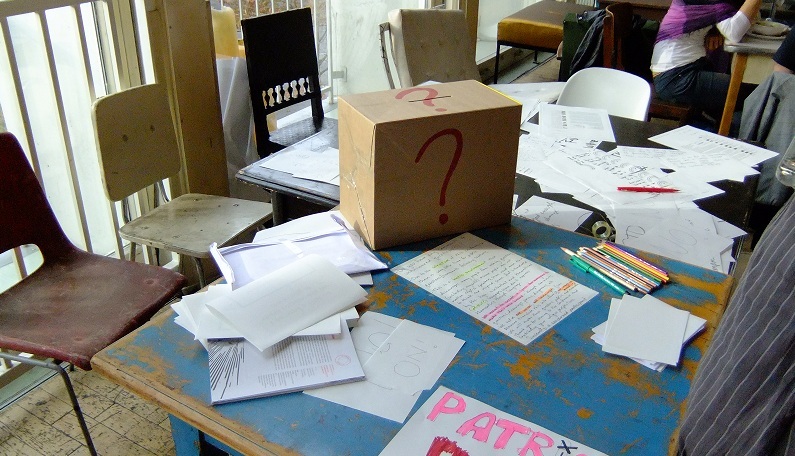 Creating Alternative Worlds, the latest day-long workshop organised by the Protest Camps Research Collective, took place on January 14th at Royal Holloway in London. It brought together a group of around 30 researchers to explore the diverse geographies of the alternative worlds we are constructing within and beyond capitalism. The day itself was split into three sessions focusing on the spatialities of affect, organisation, and politics. The first session on the spatiality of affect was probably the most wide ranging discussion, taking us from the ‘shared emotionalities’ of the mundane encounters explored by Kye Askins, to Harriet Hawkin’s emphasis on the importance of the production of atmospherics by artists to the co-joining of affect and space, and the unexpected outcomes of the affective spaces created by street performers observed in Paul Simpson’s work. The ensuing discussion carried on by exploring the diverse ways in which we create affective spaces and how these may resonate, circulate and amplify, whilst suggesting a need to be alert to how these spaces can resist capture and be sustained. The second session explored the spatialites of organisation, with Nazima Kadir focusing on the autonomous spaces of squats in Amsterdam and providing a fascinating ethnography of the ways in which hierarchies operate in communities that reject authority. Jane Wills then talked about the importance of ‘readiness’ and the need for social movements to work with and build infrastructures, suggesting that the buzz around ‘self-organisation’ is perhaps nothing extraordinary as it is already part of our everyday repertoires. Finally Tim Cresswell discussed the centrality of mobility to organisation, and the need to recognise the roles of diverse prosthetics to being mobile. The discussion moved between topics such as the difficulties collectives face in acknowledging their own authorities, how framing can play a key role in the success of social movements, and a general agreement on the importance of reflexivity (which often takes place through informal spaces of ‘gossip’) to movements’ organisation. The final session was the most focused on place-based protests, considering the relationship between spatiality and politics in camps. Uri Gordon begun by mapping out the Israeli tent protests of 2011, suggesting a ‘core-periphery’ relationship between the hub of Tel Aviv and the often more antagonistic, and smaller, camps further afield, a relationship which was also re-produced at other scales. Adam Ramadan explored the continuities between concentration camps, refugee camps, and protest camps, suggesting they are all exceptional, tactical and temporary. Finally, Andy Davies reminded us of an often ignored component to the ‘year of uprisings’ in 2011, the anti-corruption Anna Hazare movement in India, and the importance of fasting as a type of politics. The discussion picked up on the questions of exceptionality and temporality of camps, as well as exploring the trap of falling into the fetish of the camp as the only political expression of a movement, whilst also acknowledging the vital roles that protest camps have played both historically and to this day. Beyond the great diversity of ideas that came out the day’s discussions, the most importance aspect from my perspective was the coming together of a group of researchers, all of whom are committed in various ways to bringing their politics and activisms together with their research. As a PhD student researching within and alongside the Occupy movement, I often find workshops and conferences to be too centred on highly abstract discussions amongst a small and privileged group of academics. The Protest Camps Research Collective is part of many different attempts to create alternative worlds inside as well as outside the university. The opening remarks of Jenny Pickerill and workshop organiser Anna Kanngieser that they wanted this session to be as informal as possible, that speakers should try and avoid overly complex language and their insistence that ‘no question is a stupid question’ was a refreshing and comforting start. The smiles that bounced around the room as eyes peered through the windows at the falling snow outside also brought the first session on affect down to earth and helped to create a lighter atmosphere. I agreed with the many reminders that much needs to be done to bring our alternative worlds into the walls of the university. In particular, Kye Askins commented that we have gotten very good at thinking about emotions and affect as researchers, but less good at practising them in our workplaces. Our ability at the workshop to discuss a wide range of themes across numerous disciplines and, importantly, engage with a diversity of politics helped us to move ‘beyond ideology’, as Jane Wills discussed, towards a more grounded encounter of being. Finally, I felt a general sense of the possibilities and potentialities from within the spatialities discussed throughout the day, which resonated well with Jenny Pickerill’s opening comments on the importance of placing hope at the centre of our praxis. Overall, it was a highly enjoyable and creative day. I hope to see many more like this soon! To stay connected to the Protest Camp Research Collective’s events and speaking engagements, check out http://protestcamps.org/events and follow @protestcamps on twitter. Rural Rebels and Useless Airports: La ZAD – Europe’s largest Postcapitalist land occupation. From beyond the silences of international mainstream media that have offered hardly a whisper on ‘Europe’s largest postcapitalist land occupation,’ LabofII recently brought out this report of protest camp life and action at La ZAD. Protest Camp’s Anna Feigenbaum discusses No Dash for Gas‘ West Burton power station protest camp in the broader context of direct action and Climate Justice. As Hurricane Sandy swept up the Eastern seaboard of North America, after wreaking havoc on Cuba and the Caribbean Islands, across the Atlantic sixteen people crept up the chimneys of a power station to protest polluting fossil fuels. Wrapped in warm clothing and with supplies to last a week, protesters took to these chimney tops, 80 meters above the ground. Every day of their occupation prevents 2,371 tonnes of CO2 from being emitted, the amount an average home would use in 182 years. The target of their action, West Burton power station in England, is a project of big 6 energy firm EDF. This corporation’s track record includes a 1.5€ million fine for spying on Greenpeace, engaging in a secret lobbying campaign regarding subsidies for the disposal costs of waste from their reactors, and covering up flaws in reactor design that could lead to a Chernobyl like disaster. Just last week EDF announced a 10.8% rise in energy prices for its customers, affecting three million households with this hefty hike in a time of austerity. 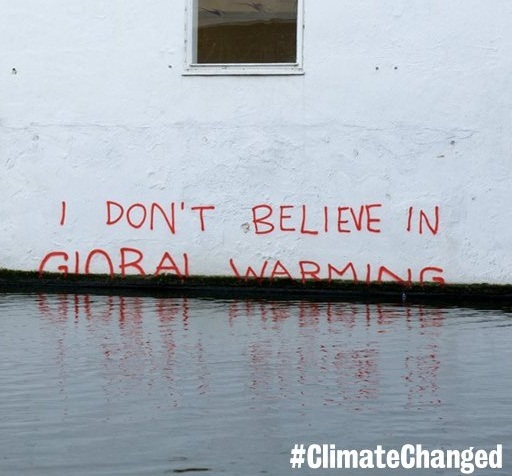 Despite the rise in ‘superstorms’ like Sandy, in our culture climate change is still seen with scepticism. Clean energy initiatives continue to be treated as corporate charity gestures, rather than as the innovations necessary for the future of our planet. In this climate, direct action is what it takes. 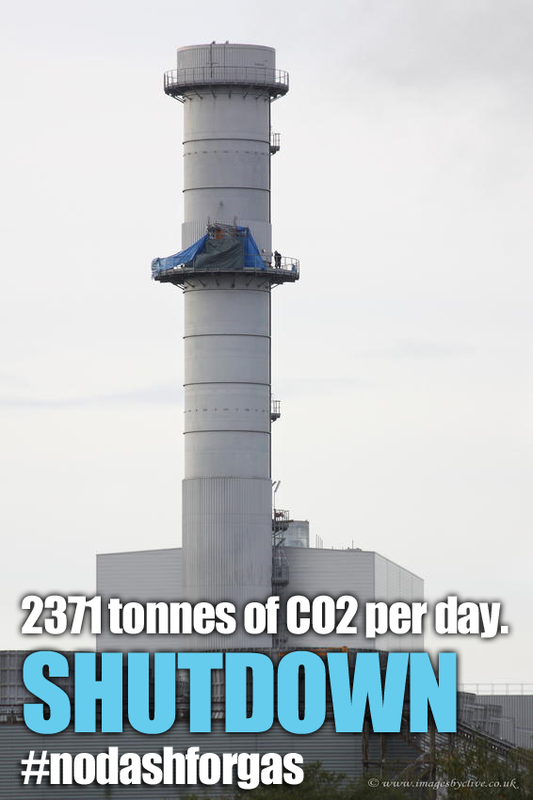 The targeted West Burton power plant is only one of up to 20 new gas-fired power stations the British Government has planned. Joss Garman, political director of Greenpeace, told the Guardian: “Green-lighting a whole fleet of new fossil fuel power stations would cause a huge jump in emissions.” Climate Justice campaigners, like Garman, want to know why public resources—and taxes—are not being redirected into sustainable energy initiatives. No Dash for Gas isn’t the first time in recent history that a direct action campaign has climbed its way to climate justice. While ‘Climate Change Activism’ may be a 21st century term, just a decade before the millennium, thousands in the UK protested a pollution heavy, gas-guzzling scheme to extend the roads network. Combined with the dedication of those engaged in on-going (closer to the ground) campaigning efforts like the work of Friends of the Earth and Platform, direct action amplifies the call to immediately attend to these pressing issues. 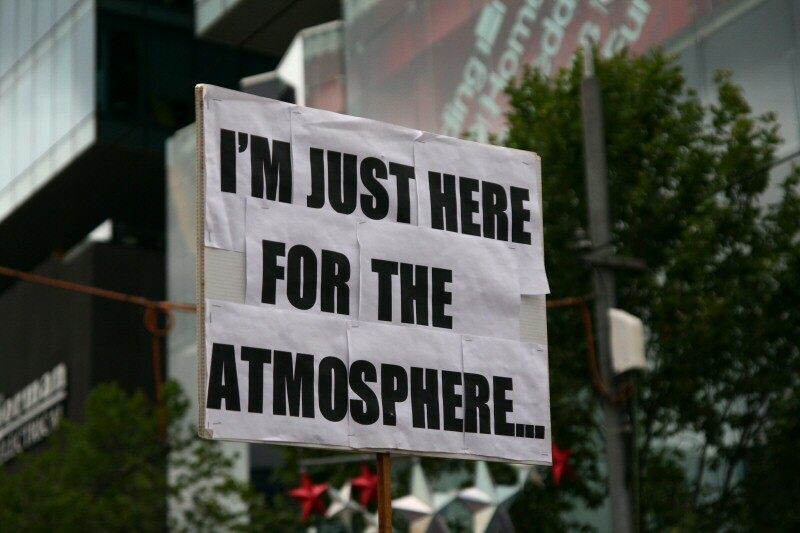 In the past few years the UK and Ireland has seen a vast array of protest against corporate culprits of climate change. From 2006 to 2010 ‘Climate Camps’ were organised all around the UK targeting major corporate profiteers of carbon emission from BAA’s Heathrow airport expansion to the European Climate Exchange in London. These camps spread around the world, with direct action sites organised in Canada, New Zealand, Australia and Italy, to name only a few. 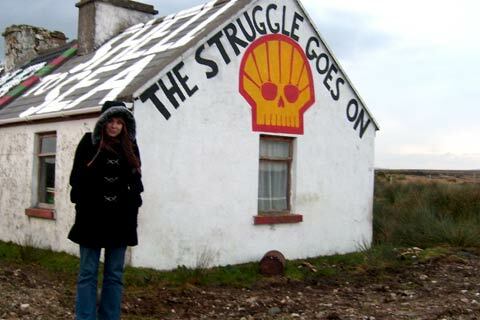 In Ireland, the Shell to Sea campaign remains active against Shell’s destruction of the Kilcommon community in their profit-driven pursuit of Oil. Fuel Poverty campaigners have occupied the offices of EDF and British Gas in London, while No Fracking activists and The UK Tar Sands Network draw attention to huge fossil fuel initiatives set on further climate destruction. Meanwhile, UK groups Climate Rush, Liberate Tate, Rising Tide and BP or not BP target energy oligarchs like BP and Shell. These groups have used soliloquies, flash mobs, pop songs, die-ins , oil spills and even ‘the gift’ of a 16.5 metre wind turbine blade delivered to the lobby of Tate Modern a few months ago in protest of their on-going sponsorship by BP. Crucially, direct actions like ‘No Dash for Gas’ perform the very connections that need to be made. They draw the links between corporate profit and fuel poverty; between sustainable technologies and sustainable economies; between our need to defend the global commons and the collective resistance it requires. 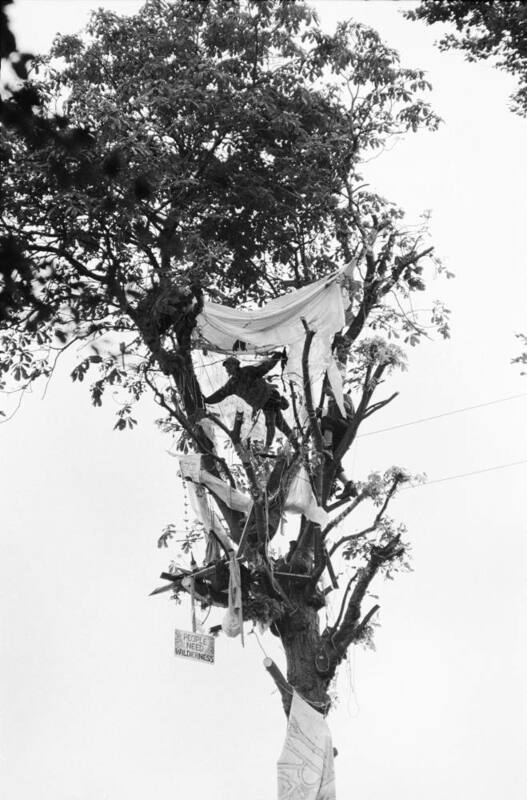 In this guest blog, Maxine Newlands situates the recent arson attack against Camp Florentine into a broader history of protest camps as vulnerable spaces, from Greenham to ZAD. Protest camps remain one of the strongest forms of activism in the world, and one of the most vulnerable forms of protest. Over the past few weeks and months activists have celebrated the anniversary of Occupy, and twenty-years since the Twyford Down camp (1991-1992). We’ve also witnessed resurgence in protest camps as a political strategy, with camps and blockades emerging against airport expansion and mega-dams. The ZAD Occupation against airport expansion, at Notre-Dame-des-Landes, (near Nantes, France) has faced eviction, regrouped and doubled in size. The world’s oldest tribe, Penan, continue to blockade that construction of Sarawak’s (Malaysia) largest hydro-electric dam. And the ‘twenty years since Twyford’ anniversary was a platform to launch a new campaign that highlights the vast road building plans of the coalition. [i]As former Dongas and activists’ both old and new donned sashes listing proposed new road building sites, the celebration of protest camps was marred with conflict, when an Australian protest camp was destroyed in an arson attack. The communal meeting area, kitchen, information point, camp vehicle and rear storage areas were all reduced to cinders[ii]. Camp Florentine or Camp Floz as it is affectionately known lies deep in the heart of the Tasmanian forest. The camp is a two-hour drive from Tasmania’s capital, Hobart. The camp is surrounded by the world heritage site The Florentine valley, home to some of the world’s oldest eucalyptus trees, and habitat of the depleting Tasmanian devil. The devil’s numbers are diminishing from a cancer-like illness and logging of its territory. Still Wild Still Threatened collective established the camp almost six years ago in the Upper Florentine valley[iii]. Although the valley is surrounded by world heritage site status, the Upper Florentine remains unprotected from logging companies. Along with the Styx, Weld, Arve, Picton and Wedge valleys, they are all harvestable ground for the timber industry. The camp blockades a logging route into the valley as activists gather evidence on the impact of logging practices on the Tasmanian devil’s home. The latest arson attack is the third such assault on Camp Florentine. In 2008, two activists, locked-on to an old car were brutally attacked by suspected pro-logging campaigners. The assault, filmed by a third activist[iv], shows ‘a sledgehammer-wielding man assaulting a disabled blockade car, with two protesters caught inside, before others kicked in its windows’(Darby, 2008) [v]. The footage was viewed globally and over the following weeks ‘the event and the broader environmental issue of logging in Tasmania continued to feature in broadcast and online news and newspapers’ (Lester[vi], 2010:131). One of the two protesters involved in the attack, Miranda Gibson, is currently Australia’s longest-running tree-sitting activists. Gibson is living 200 foot above the valley floor, under the canopy of an old growth Eucalyptus tree. 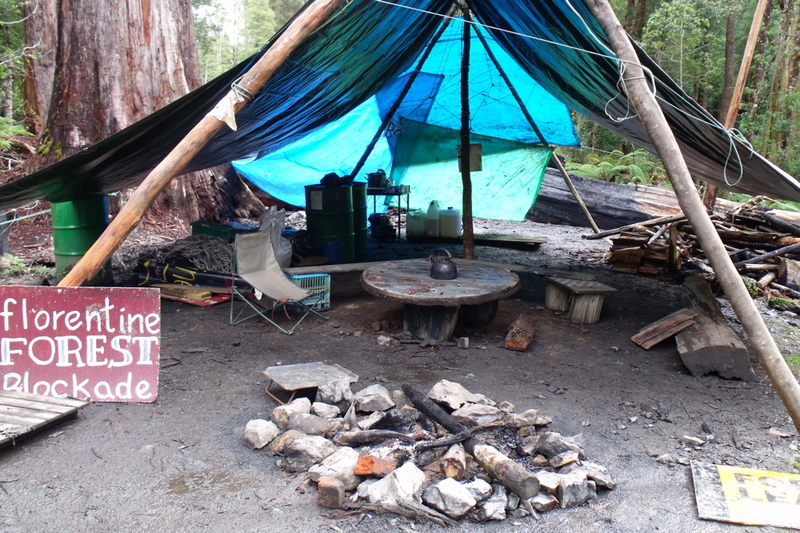 From her platform, Miranda blogs at Observertree.org[vii], charting the continued logging activity, Tasmanian devil sightings; and as a media spokesperson for Camp Florentine’s grassroots organisation ‘Still Wild Still Threatened’(SWST). Then leader of the Australian Greens, Bob Brown hinted the attacks were linked to pro-logging contractors. 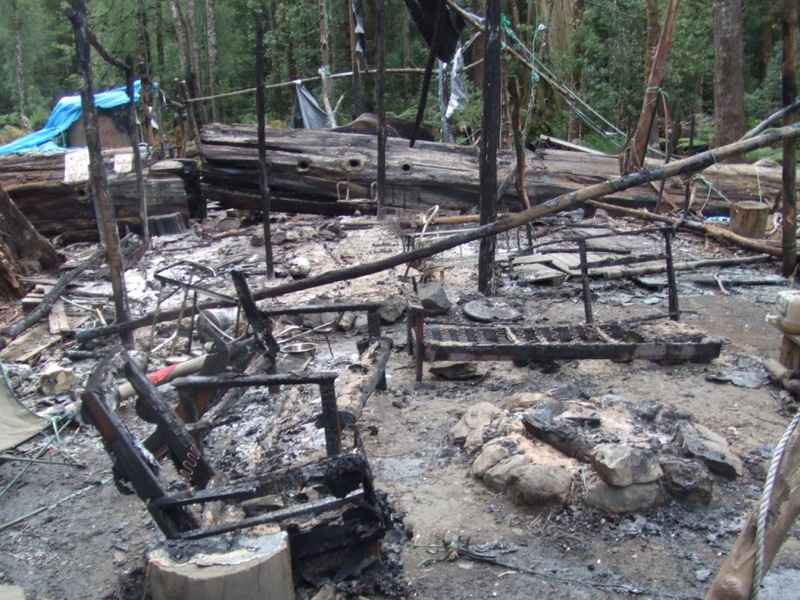 Brown said the attack was ‘a return to the violent lawlessness of logging vigilantes two decades ago…This pro-logger vigilante attack held the people camped nearby in terror. Like the gelignite bombing of two cars in the East Picton forest in 1991, and the loggers’ violent attack on protestors at Farmhouse Creek in 1986’. 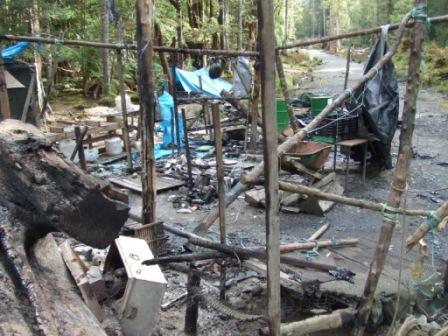 Tasmanian Detective Constable Craig Fry believes this latest attack was misguided revenge for earlier vandalism on logging firm Les Walkden Enterprises. Fry said the incidents ‘do not appear to be linked to any kind of protest activity’, when arsonists caused $700,000(Aus) worth of damage to mechanical logging equipment. The Camp Florentine attack highlights the vulnerability of protest camps, and their precarious status at the hands of external forces. 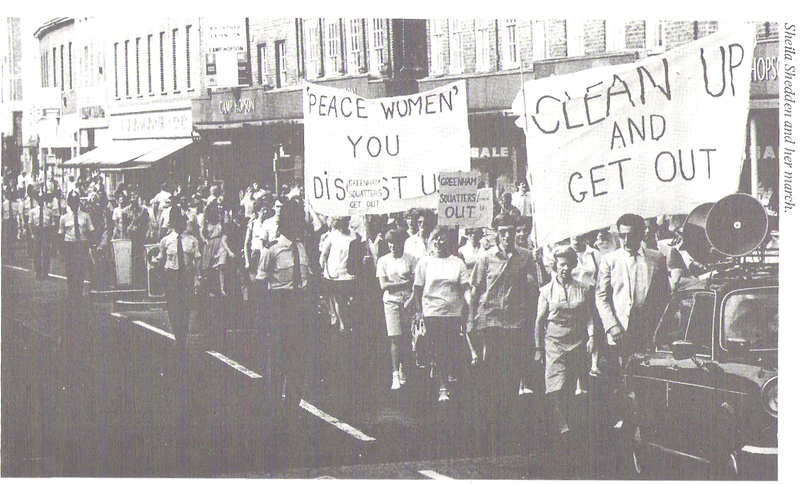 Despite over forty years of global protest camps, from Greenham Common Peace Camp to Camp Floz, camps remain vulnerable to attack, and acts of repression. Blockade protest camps are often isolated from society, both geographically and metaphorically. Like Camp Florentine and Greenham, isolation increases any vulnerability. You did feel it was very dangerous, [at Greenham] and here [Occupylsx] was different. At least you’re not out in the middle of the countryside in the same way…where we were living, I was in a bender, at Orange gate, right up-against the fence and the squaddies were going around at night with sharpened metal stakes, and sticking them in [the benders]. We had to call the press, and we did an interview, and that was our protection. 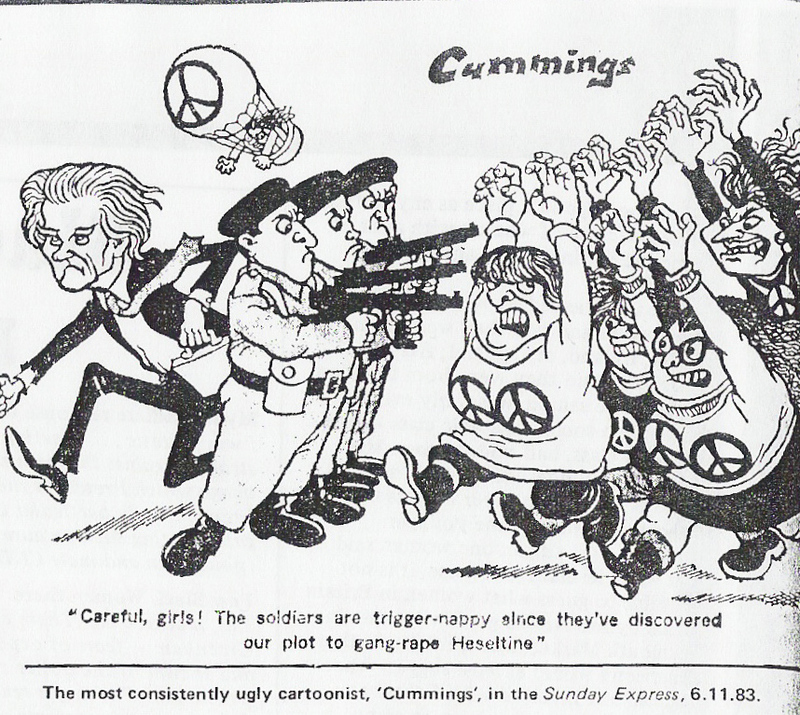 Another Greenham and CND campaigner, Barbara Tizzard, experienced a particularly nasty attack. Whereas Sian notes, ‘the Occupy camp was different because you were in the city, but on the other hand, it’s also when you’ve got a mixed camp [gender], a mixed environment, you know you have to work things out, you have to tackle if there is sexism or any of that together’. Whether isolated or in the heart of the city, protest camps are vulnerable because of their openness. That’s not to say they shouldn’t be open, but it places them into a precarious position. Threats can also subvert from the inside through acts of state repression. As Ruth at OccupyLSX camp notes, ‘I think it was vulnerable, and we know all around the world police are actively bringing people to the camps that they thought would make trouble for us. You know, so that vulnerability was actually increased’. Between 1994 and 2000, a number of parliamentary measures gave greater powers to the police to conduct surveillance exercises on the activist movement. The National Extremism Tactical Co-ordinator Unit (NECTU[xiii]) (2004), the National Domestic Extremism Team (2005) and the Counter Terrorism Command[xiv] (2006) had powers to monitor and prevent any protest in order to ‘gather intelligence so appropriate policing could take place’ (Hattenstone, 2011[xv]). Other notable undercover police work includes, PC Peter Black who infiltrated the M11 extension protest, Wandsworth, East London (1993); PC Jim Boyling, under the pseudonym, Jim Sutton infiltrated the Reclaim the Streets; PC Lyn Watson would later infiltrate the same group of people as part of the Clandestine Insurgent Rebel Clown Army (CIRCA); and PC Mark Jacobs who attached himself to the global justice movement, the G8 summit (2005) and later G20 protest camps (2009). Activists were not surprised that Kennedy had been amongst the collective for a seven-year period: ‘we assume at every meeting there are at least one journalist and one special branch officer’ (Anon, 12:42). Kennedy’s action was subversive and left those who had relationships with him emotionally damaged. From political policing to physical attacks, protest camps are exposed to external and at times internal forces that impact on the day-to-day running, and the wider movement. Despite both physical and psychological damage that protest camp are open to, they continue to be a strong source of activism. In the same period that celebrated the twentieth anniversary of Twyford, and as new camps emerge in France and Malyasia, there are plans for camps around next year’s G8 meeting in the Lake District, and Occupy. As for Camp Floz, the rebuilding has begun. The communal area and information huts have risen from the ashes. The new commune area, although a little smaller, has been rebuilt at as point to organise action and continue to support Miranda who remains in her tree-sit. [viii] Foucault, M. (1986). The Care of the Self: The History of Sexuality. Vol. 3. Translated by Robert Hurley. New York: Random House. [xiii] NETCU is a national policing unit set up by ACPO to respond to the threat of domestic extremism in England and Wales. NETCU’s objective is to aid peaceful protest, and rout out “a few individuals [who] resort to criminal activity to further their cause. These individuals sometimes try to hide their illegal activities by associating themselves with otherwise peaceful campaigners.” They are overseen by the Counter Terrorism Command. For more information, see http://www.netcu.org.uk/about/about.jsp (accessed 17 October 2012). [xiv] The Counter Terrorism Command took over terrorism-related issues from the Anti-Terrorism Squad and Special Branch. Their remit is to provide a response to “terrorist, domestic extremist and related offences, including the prevention and disruption of terrorist activity”; gather intelligence on terrorism and extremism in London, bomb disposal, work with the “British Security Service and Secret Intelligence Service” and to offer “protection of British interests overseas and the investigation of attacks against those interests”. For more information, see http://www.met.police.uk/so/counter_terrorism.htm (accessed October 2012). How might activist-art be supported rather than undermined by the visibility and space offered by contemporary cultural institutions? 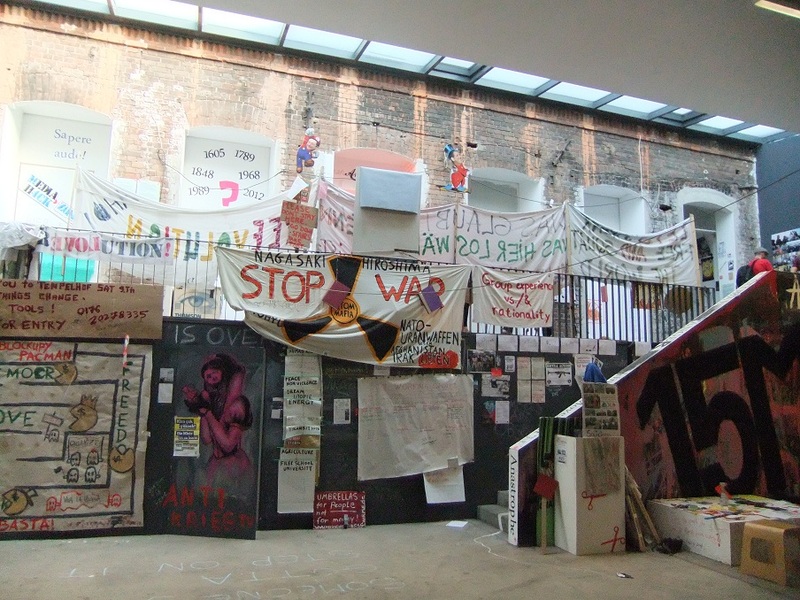 Reporting on the Truth is Concrete festival in Graz, Austria, guest blogger Gavin Grindon looks at recent trends that bring protest camp structures into the art world. Since late 2011, the cultural capital of protest camps has risen rapidly. One of the places this has been both reflected and reproduced is in the art world, with a wave of adoptions and appropriations of the visual and material culture of recent movements, and especially of protest camps, in exhibitions and biennales. While this de-marginalisation of what Yates McKee has recently framed as the “aesthetic techniques”[i] of social movements is to be welcomed, it raises the central question of how these techniques are transformed by being placed in this frame: not only in the particular incidence of some object or image appearing and the familiar discussion about ‘recuperation’ which might follow, but in how this appearance on centre stage impacts upon the ongoing working of these techniques outside this context, and the demarcation of what is legible as the field of ‘the political’ more generally. 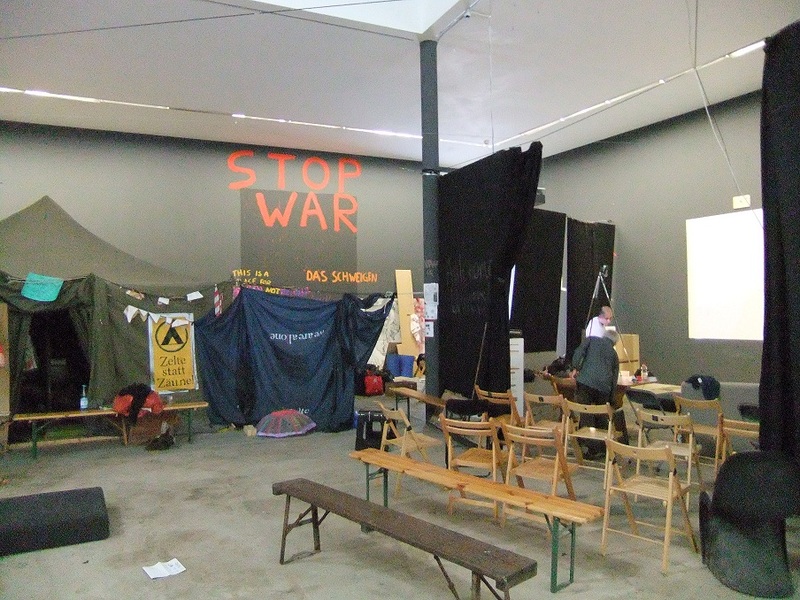 This adoption of the material and visual culture of protest camps has occurred in the context of several related trends; the growing vogue in contemporary art for participatory and socially-engaged art practices, particularly those which make broad political claims or utopian promises[ii]; at the level of cultural policy, the tendency for biennales and large exhibitions to geographically shadow international governmental gatherings (and their accompanying summit-camp protests), drawing on and adding to the claims often made for these temporarily composed city-sites as spaces of democratic debate;[iii] and lastly the contemporary art vogue, associated with both these tendencies, for embracing political art, especially extra-institutional or ‘activist-art’ work. This tendency is evidenced by, for example, the 2008 Taipei Biennale or the 2009 Istanbul Biennale as well as many other smaller shows over the last few years. Its reception within the art world exhibited a not-dissimilar but typically even more simplistic and abstract conception of political possibility. [viii] Given the combination of the agitational tone of the biennale’s announcements, which attacked much of the art world’s pretentions to political agency and called instead for a turn to use-value – and the act of placing some of this broadly ‘interventionist’ work in a context of international art tourism which has previously mostly neglected and derided them – the slew of negative reviews were to be expected. This isn’t the place for an extended critique of the hopeless critical impoverishment which regularly underlies the vacuous conceptual shitstorm of contemporary art criticism’s approach to political engagement. But what became repeatedly clear is that the narrow critical terms with which the work was approached, many of the practices supported were all but illegible to these critics as art (one common criticism was that there was nothing to look at). When it came to the camp, one of the most common readings was that Artur Zmijewski, one of the curators, had placed Occupy in the space as an egomaniacal move which made the camp part of his own artwork. His previous work had typically put controversial or subaltern social groups in awkward or ironic positions. 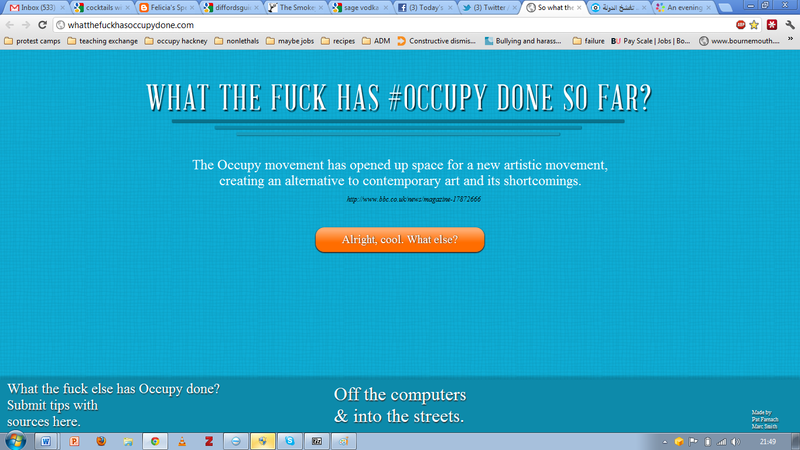 My own, albeit fleeting, experience of this space was that there were several problems with this invitation to occupy. Certainly there was a curatorial problem in the assertion of autonomy for the camp, and the inevitable limits which were to be placed on it. However, in Berlin the main problem seemed to be with the camp itself and its response to the space. I was only a brief visitor, so these are only my impressions rather than a participant or fully-grounded account of events, which might reveal a different story. My impression, however, was that the camp had responded to the space of a biennale by understanding itself as in exhibition, as on show. 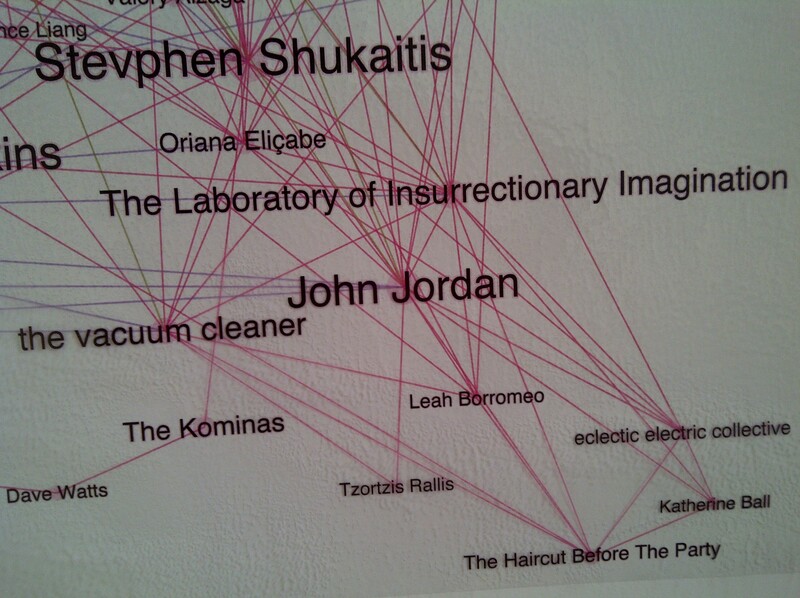 The occupiers used the space to start making art. There were several installations, some using video, around one side of the camp. There was also an intense profusion of banner-making and sloganeering wall-painting and graffiti. However, most of it appeared to be an ostentatious performance of political identity, made up not of either specific social demands or new poetic slogans, but assertions of identity and behavioural injunctions. The result was not only some rather ugly banners by the standards of many recent protest banner making, but some embarrassing and awkward lowest common denominator sloganeering, whose broad and nebulous claims sometimes seemed like a caricature of ‘activist’ identity. In only understanding the space as an exhibition, and not in fact as a camp, the occupiers seemed to in fact play into their critics’ hands, and rush headlong towards the kind of discomfort and antagonism created by the collision of ossified identities one finds in Zmijewski’s art. In terms of the potential uses of the space, it seemed like a missed opportunity. Rather it provided not so much a functioning project-space as an impetus to critique how the pairing an art institution and activist projects such as protest camps might relate to or transform each other. This all brings me to where I’m sitting now, several months later, not at an exhibition but at a cultural festival, Truth is Concrete in Graz, Austria. The event has some curatorial overlap with the Berlin Biennale, but explicitly takes a different organisational form. A 24/7 ‘marathon camp,’ in which a mixture of screenings, performances, workshops and presentations, and an open stream of impromptu events occur at all times, day and night for a week. However the number of formal lecture-style presentations debilitatingly outweighs other formats and brings it closer to something like Creative Time’s ‘summits’ in New York. The model of a durational camp seems to borrow its model from Occupy camps. But the intensive and exhausting model of a marathon, aside from its competitive associations, seems an awkward match for a productive space of critical reflection and convivial collaboration. The event also, crucially, describes itself as a camp, with invited participants (myself included) put up in dorm-style rooms on site in order to participate in events, and with daily general assemblies. This transposition of an activist organisational form, most recently associated with occupy camps, into a cultural festival is a problematic move. 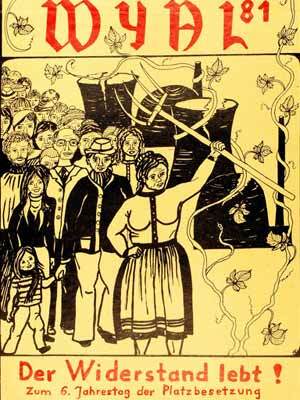 Such assemblies emerged as a part of social movement strategy with a specific function, addressing in radically democratic fashion what is to be done, whether organising a direct action or fixing the compost toilets in the camp. In the festival, this bottom-up strategy is turned upon its head and returned as a top-down cultural policy strategy. Decisions about events, from timetabling and food distribution to general critical orientation have already been decided by the curatorial team. The GA instead becomes a managerial ‘feedback loop,’ a space for complaint or perhaps some responsive debate, but not for organisational decisions or structural change. Its strategic function had fundamentally changed, and became one determined by the structure of inviting groups together as part of an annual cultural ‘show’ rather than by those groups wilfully collaborating for their own strategic reasons. This strategic disjunction was embodied in one image. Burak Arikan had produced a map of social movement strategies for the Berlin Biennale which was reproduced for this event, using data analysis to connect words such as ‘appropriation’, ‘documentation’ or ‘humour’ in participants’ accounts of their work, with common phrases printed as central nodes in larger type. On the opposite wall, the same approach was applied to the network of names involved (though these were only official speakers– those invited to stay and make up the camp remained invisible. Speakers were also geographically separated, with hotel accommodation outside the camp. Likewise on the event’s website speakers and ‘grant holders’ were listed separately). With some participants appearing in huge text, with connections to all the others, and others in smaller type, this was not a movement of shared political strategies, but a map of cultural capital in action. A few days in, a cheeky vandal added ‘Karl Marx’ in the bottom left corner in tiny type, with no connection to anyone on the map. This seems quite a strong critique, but it is a critique of only one part of the festival. It is also offered in the spirit of trial and error which I found in Berlin. The question seems to be how activist-art, aligned with movement strategy, might be supported rather than undermined by the visibility and space offered by contemporary cultural institutions? As they are, such institutions are not often geared either organisationally or intellectually to a productive engagement. Over the first few days, with this dynamic in place, frustration seemed to grow among many participants – especially those who were used to being active. I undertook a radio project with Anja Kanngieser titled ‘What Moves Us?’ which took the form of an inquiry into the composition of the event. Interviewing participants separately, there were common responses that they felt blocked or frustrated, that “something needs to happen.” The preponderance of the lecture format, often with no time for questions or open debate, and given overwhelmingly by white male figures, became oppressive as video and audio of the talks were live streamed into the cafe. Even when eating dinner or having a drink, the drone of male voices continued to be piped in over one’s convivial discussions with others. 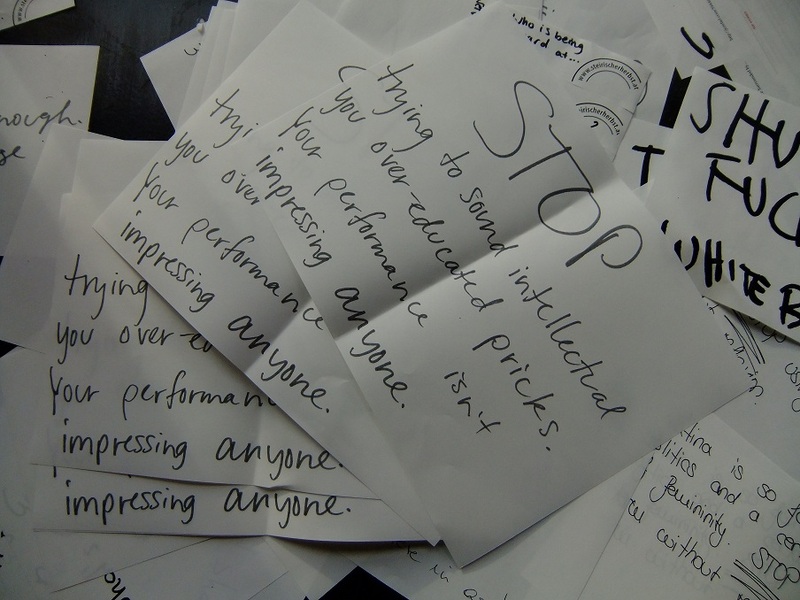 By the third day, the space had been covered in more or less coherent hand-made signs exhorting one to ‘shut up, white boy,’ or berating the speakers for the overuse of elitist academic and theoretical language that covered up more than it explained. I also heard responses in the other direction, which complained about the imagined ‘anti-intellectualism’ of these complaints. My own response in this case was that what was being asked for was actually a more sophisticated intellectual engagement, grounded and interrogable rather than evasively abstract. One other speaker even suggested that his job was to create new ideas for ‘activists’ to use, apparently intimating that they should stop complaining and get to work lugging his excellent concepts around the city, which prompted a sharp discussion about where radical theoretical ideas actually come from and what kind of use they have. As actions go it had clearly been a little rushed in its conception and organisation, but this was a kind of open, experimental learning grounded in embodied, practical collaboration rather than debate or theoretical discussion. Changes were evident in the format of discussions, too, as some speakers moved from the stage to the floor and began talks announcing that they were happy to be interrupted at any point for questions or requests for clarifications, and tended to give more time for discussion rather than presentation. On the Thursday, participation in the GA seemed to dissolve and Dmitry Vilensky of Russian collective Chto Delat, asked to facilitate, instead suggested that what they had was a different sort of forum which deserved another name. From the mixture of support and fear from the curatorial team regarding rumours of an actual action occurring, it seems there were also strategic conflicts at an internal organisational level, but the vision of those within the team who did push for a more genuine engagement is deeply heartening among the other stories one hears of the depressing lack of curatorial backbone and honest intellectual engagement when dealing with activist-art. [xiii] With two days to go, it seems inappropriate to try and summarise just yet as much as the vision of the event is laudatory in so far as it attempts not to simply ‘show’ the new vogue for activist-art as a means to accumulate cultural capital, but makes some effort to intellectually and ethically engage with it in terms of the strategies from which it emerges. [xiv] But there is much work to be done. [i] Yates McKee, “Eyes and Ears” in Michel Fehrer, ed. NonGovernmental Politics, Zone, 2007. See also his forthcoming Sensible Politics. [ii] On this utopianism, see TJ Demos “Is Another World Possible? : The Politics of Utopia Recent Exhibition Practice” in Gavin Grindon, ed. Art, Production and Social Movement, Autonomedia/Minor Compositions (forthcoming), as well as Claire Bishop, Artificial Hells, Verso, 2012. [iii] See Kirsty Robertson, “Capitalist Cocktails and Moscow Mules,” Globalizations 8:4, 2011. pp. 473-486. [iv] I’d also like to say thank you to Amber Hickey and Stefano Harney for reading it over and offering some really helpful comments. [v] It would be possible to point to precedents too, from Mark Wallinger’s 2007 State Britain, recreating a camp in a gallery, to popular actions such as the occupation of the 1968 Venice biennale and Milan triennale. [xi] See Sloterdijk’scontribution to Latour and Wiebel (eds) Making Things Public: Atmospheres of Democracy, MIT Press, 2005.